The Rampart Award is part of our Modern Collection. The award is a piece of clear acrylic that is attached to a chrome metal base. This item is currently available in only one size. Perfect for any recognition or award ceremony, including sports, corporate or educational applications. 8" x 4-1/2" x 2"
The Rampart Award is part of our Modern Section and is one of our newer, more cost effective pieces. The clear acrylic faceted piece is attached to a chrome metal base. Perfect for any recognition or award ceremony, including sports, corporate or educational applications. 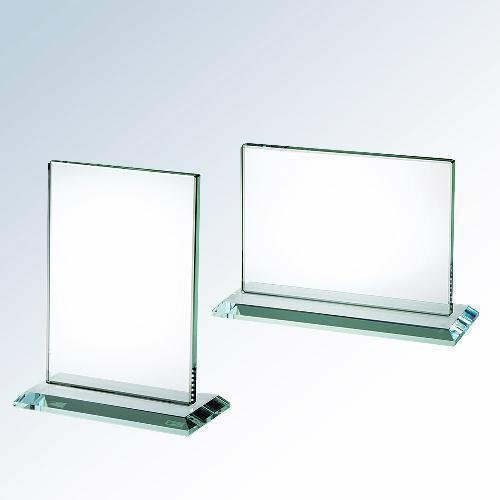 8-1/2" x 4-1/2" x 2"
The Clear Victory Award is part of our Modern Section and is one of our newer, more cost effective pieces. The clear acrylic faceted piece is attached to a chrome metal base. It also has a metal star on top that is attached using UV glue. Perfect for any recognition or award ceremony, including sports, corporate or educational applications. The Ramsey Arch, available in four sizes, has plenty of space for a personalized message. Core values, customer service, and sales achievement are all brilliant opportunities to recognize a deserving recipient. Production lead time for this product is 11 days. Optic crystal half diamond is mounted on the front of the crystal award and packaged in satin line premium gift box. Great for corporate promotional programs as well as donor gifts. Available in two sizes. Star fire Glass Award Reach For The Sky Award 5/8" thick, 3" deep base attached. Cardboard gift box included. Corporate Gifts- Optical Crystal Real Estate. Foamed Gift box included. The real estate industry attracts successful, driven, salespeople. Choose a sales achievement award that symbolizes this dynamic industry for an upcoming recognition event. These jade plaques would be great for any occasion. 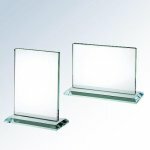 Bulk packed; select base and gift box from optional accessories for horizontal rectangle awards. Case Study - Promo. Mktg. Phone: 501-232-9506 Toll-Free: 800-472-5155 Powered by BizWizard ShopKart by NetSoft Studio, LLC.